Subaru quietly showed up the new Toyota Supra at the Detroit Auto Show yesterday by unveiling a WRX STI S209 with even more power than Toyota’s revived sports car, despite having an engine now older than our last intern. But that wasn’t the only nice surprise on the show floor—the automaker brought a couple very special classics out of the vault as well. First, in going over to investigate the 341 horsepower S209, I was delighted to find this pristine rally blue 2004 WRX STI proudly on display next to it. This one took me back. I was in high school when the WRX first came to America, and I was already a huge fan from rallying and Gran Turismo and the like. I wanted one so badly (I’d finally buy one a few years later) and then like a lot of enthusiasts I was stunned at Subaru’s decision to bring the Evo-fighting, top dog STI to this country as well. Three-hundred horsepower was a hell of a lot back then. The car seemed like an absolute monster, a 911 Turbo for people on a beer budget instead of a champagne one. Sure, you still see plenty of early 2000s WRX STIs driving around. But they’re rarely in showroom condition like this one. You may now be asking: “Is that a 22B?” And the answer is hell yes, it is. Right-hand drive and everything. 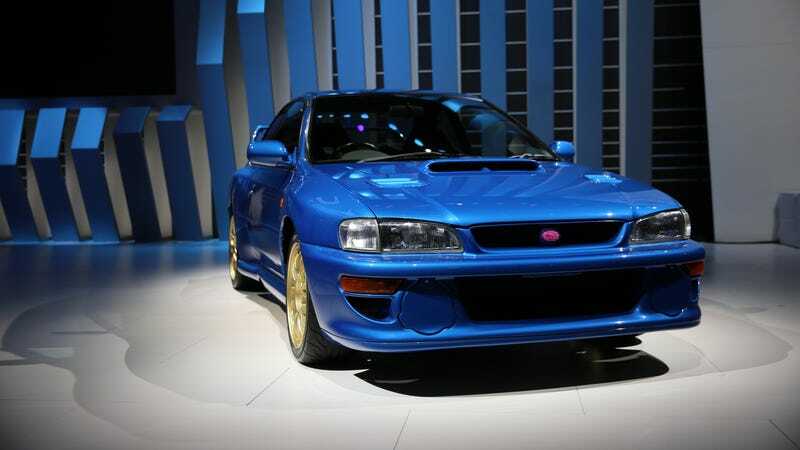 Arguably the most famous performance Subaru of all time, it’s basically a street version of the ferocious racing Impreza used to win rallies left and right in the 1990s. With an upsized 2.2-liter turbocharged boxer four, 280 horsepower (officially, at least), a slew of racing-style suspension enhancements and an adjustable rear wing, the hand-built 22B was a force to be reckoned with in its day. It’s also exceedingly rare. Only about 420 were ever made. Subaru keeps this one at its U.S. headquarters in New Jersey and hauls it out on occasion for promotional events. Still, that doesn’t happen often. This was the first time I had ever seen one in person, and it was a unique treat at an otherwise mostly bland Detroit show. Sadly, the 22B is gone from the show floor today and headed home, so it won’t be around for the public days of the Detroit show. It’s a shame. I wish more people could get to see this remarkable and rare machine. At the very least, I’m glad Subaru is still committed to its family of fast all-wheel drive sedans, even if it’s the big SUVs that make all the money these days. My Subaru WRX Is Cursed! What Car Should I Buy?